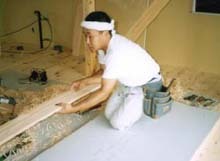 installation of a wooden ofuro is quite simple. The hot tub basically is simply laid on a waterproof floor. Wooden wall panelings are popular with hinoki tubs but we recommend a 30cm protection above water level for easy maintenance. 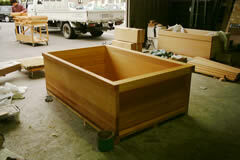 Commonly there are 3 reasons to use a waterproof floor with floor drain in combination with a hinoki tub. 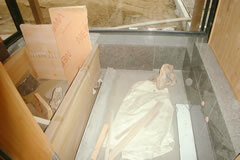 R1) The first is as a double safe, to pick up some condensation or a discharge caused by an eventual crack in the wood. R2) The second is for having a "shower area" to wash the body before entering the tub (which must be used for soaking only). R3) The third reason is to drain the water overflowing from the top of the tub. 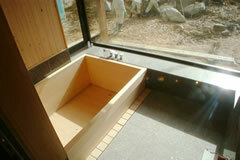 This solution is adopted often in remodelings and when the bath is installed in an apartment. It allows for the beautiful front panel with its masterful joints to be shown.This solution makes it easy to realize a japanese-style bath-room unit, where the whole floor is waterproofed and sloped. A wood grate (sunoko) constitutes the flooring and provides great comfort and practicality (yes, you will be able to shower without worrying about leaking water on the floor!) 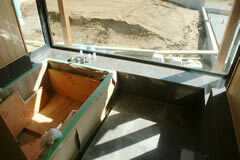 The optimal step from finished floor to the edge of the tub is between 500 and 650mm. In this case we have a masonry separator between the floor and the bath-tub itself. This solution allows for any adjustment in the levels, from flat floor to semi-recessed to recessed for barrier-free entrance and egress from the tub. 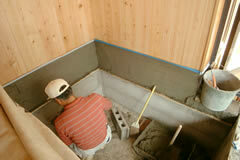 Recessed solutions find the perfect applications at the ground floor of single family dwelings. 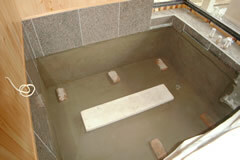 The bath-room floor can be waterproofed or not, as liked. The use of dark tiles/marble in the bathroom enhances the elegant effect of the wooden inside of the hinoki-tub.